However, some of those remarks are extremely harmful to your present and future self and even attach to your identity as woman, mom and wife. 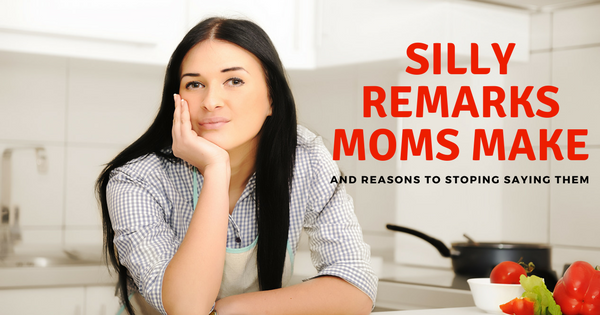 A mom might say these comments hoping someone might sympathize with you and understand your life a little bit more. You might even say them to express what you are feeling inside- and truly, that’s great, because you are not holding things in. Look… I get it, I’ve been there… In fact, I’m all in favor of something I call TIMED COMPLAINING. But Timed Complaining has a very specific purpose and it achieves a particular outcome. However, the above remarks are not “timed complaining;” rather, they are words being imprinted in your unconscious mind, with no particular purpose and which are having a short and long term effect on your future thoughts and behaviors. Truth: YOU ARE NOT LAZY- If you are a mom…you are definitely not lazy. Having children does not allow us to be lazy. What you are is just TIRED!! Try to get some sleep (have hubby watch the kids, or go to sleep earlier). Truth: YOU WERE PERFECTLY CREATED TO GET THINGS RIGHT WITH YOUR CHILDREN- When I say “right” I don’t mean perfect, I just mean right for them. Truth: YOU ARE CREATED TO NURTURE AND LOVE- Even when you don’t feel like it, your heart is most fulfilled when you are loving and nurturing your family. At times you might feel stress and pressure, but rather than hoping they’ll leave home, what you want is to create peace at home now, so you enjoy each season of your life to the fullest. Truth: YOU HAVE THE POWER FOR SELF-CONTROL AND SELF RESPONSIBILITY- It’s important you take responsibility for the environment you have created and for the environment you’ve allowed. Recognize that if change will take place, it must start with you. There are ways for you to exercise self control, so the children’s behavior can improve and you can respond in positive ways. The goal is to validate and honor your feelings, while guarding your thoughts and words, because they have power. A LOT of power. When you are conscientious about how your thoughts and words affect you, you can create a more hopeful future for yourself and for your family.